There are two large data revisions in the December update, beginning with a new set of pore pressure surfaces aligned to important paleo horizons. The paleo observations identified as the markers for important deposode divisions (as defined by Art Waterman of Paleo Data, Inc. and Bill Galloway of the University of Texas) were used to create gridded surfaces for the entire Gulf of Mexico. The original mud weight and sand pressure gradient surfaces, in 1,000 foot intervals, were then interpolated vertically to assign a pressure value at the intersection of the paleo surface. These pore pressure surfaces can be added into ArcMap under the Geology/Geophysics section to the GOM3 toolbar. Mud weights at the Pliocene-Globoquadrina altispira horizon. Historical storm tracks have been overhauled to display points at the 6-hour intervals of each storm along with the tracks. These points include the storm name, wind speed and barometric pressure. Wind radii and wind swaths are available for storms since 2008. These diplay the areas for 34-, 50- and 64-knot winds. 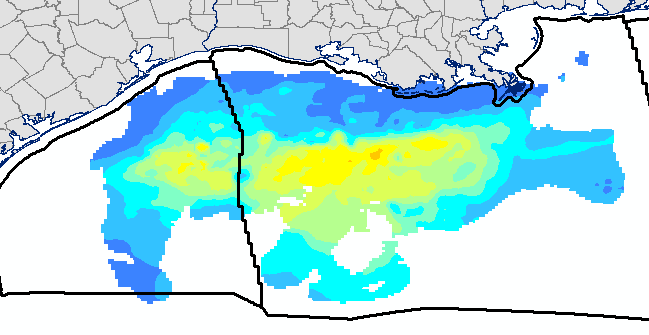 The new historical hurricane data is available at the bottom of the Environmental/Safety window in ArcMap. 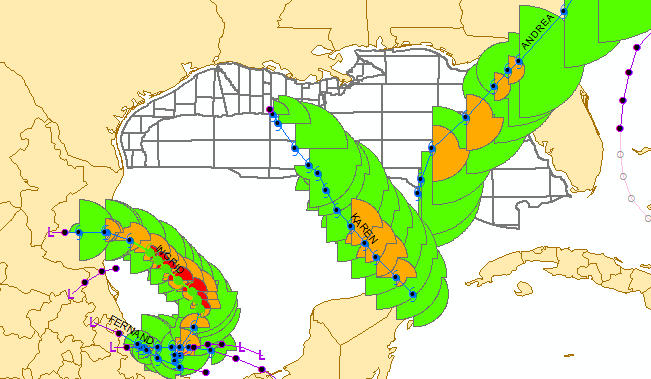 2013 storm tracks with 34-, 50- and 64-knot wind radii.